The next topic in Grammatical Construction is what I will call the Missing Verb Mistake. Now, at first glance, this might sound like a complete duh rule. Of course, every sentence needs a verb. So it sounds like this is the simplest mistake in the world. For example, if we have the sentence, the man to town with his new car. Even a four-year-old could tell, this sentence is wrong. And of course, it's wrong because it has no verb. What we need in that sentence is a verb, the man drove to town with his new car. Well, that makes perfect sense now. So you might think, why would such a simple topic be tested, on the GMAT sentence correction? Well, keep in mind, it's simple on a simple sentence like this. But this, is not so simple. Here's a much more GMAT-like sentence. Let's look at this sentence. Raised as a nobleman and educated in the leading theories of his day, Antoine Lavoisier, now universally recognized as the "Father of Chemistry," naming both "oxygen" and "hydrogen", proving that sulfur was an element. And contributing to the formulation of what we now know as the metric system, until he was guillotined on highly questionable charges at the height of the Reign of Terror. Well, that sentence is just wonderful. It's packed fully of information. Golly. The only trouble is, it's not a sentence. There's no main verb. Now it's really confusing, cuz there are particle, participle modifiers floating around everywhere, but let's look at this. 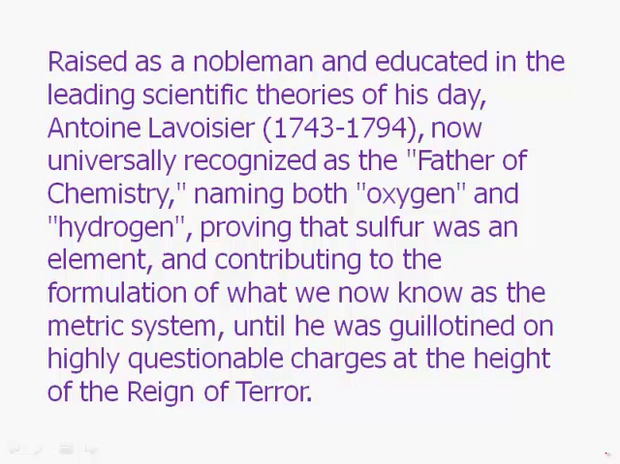 We have a subject, Antoine Lavoisier. So we have a modifier before it, raised as a nobleman. And then we have the subject, now universally recognized as the "Father of Chemistry," another modifier, so set that off. Then what we have are three participles in parallel, great parallel structure, naming, proving and contributing. Okay, so all of those, they could be modifiers, but those aren't verbs, they're not bona fide verbs. And then we get to the end of that whole thing, and then we have an until clause. So inside the until clause, the until clause is constructed perfectly correctly. That has a verb inside but the verb inside a subordinate clause can not take the place of the main verb of the sentence. The main subject here, Antoine Lavoisier, does not have his own verb. And so probably the easiest way to fix this sentence would be to change these three participles in parallel, change them to verbs. And then we would actually have a bona fide sentence. So, some strategies to keep in mind. First of all, very important to recognize the difference between participles and full verbs. The difference is, a full verb will always be an auxiliary verb plus a participle. So instead of naming, it would have to be was naming, or is naming, something like that. Second, it helps greatly to remove the fluff. Now, we had a lesson earlier on removing fluff. These would be participial phrases, prepositional phrases. When you bracket these off, it makes it much easier to see what's the main subject, what's the main verb. And finally, when you find every subject, especially the subject of the sentence, make sure you can match it, not to a participle but to a full verb.